It’s no surprise that New York City’s culinary landscape has in large part been shaped by the immigrants who made their homes there throughout the past 200 years. New York style pizza, for example, owes its creation to the large population of mostly Southern-Italian immigrants who settled in lower Manhatten. Even the doughnut, which arrived with early Dutch settlers before the American Revolution, can trace its origins to New York City. But perhaps no population has contributed as much to New York City cuisine as Jewish immigrants from all over Eastern Europe and Germany, who settled in large numbers throughout the 19th and 20th centuries. The kosher deli, an enduring symbol of that population’s impact on American food culture, is perhaps the quintessential New York City dining establishment. Known for no-frills service and Eastern European soul food, the deli has left an indelible mark on the American palette. Equally iconic is the bagel, another Eastern European import seemingly tailor-made for on-the-go city life. Both have become widely popular outside of New York City—bagels and delis can now be found coast to coast, and in recent years everything bagel seasoning has turned up, well, everywhere. Delicatessens (Delikatessens in German) originated in Germany during the 18th century, where they sold exotic fruits imported from Asia—it was only in 20th century New York that delicatessens came to be associated with cured meats, smoked fish, dill pickles, and more. The word is derived from the French délicatesse, itself derived from the Latin adjective delicatus, meaning "luxurious,” or “sumptuous.” Although delicatessens were in New York as early as the late 19th century, they didn’t hit their stride until the 1920s and 1930s. That’s when, as Ted Merwin writes in his book “Pastrami on Rye: An Overstuffed History of the Jewish Deli,” Jewish immigrants began assimilating into the middle and upper classes. Delis themselves served as social centers and meeting places where people from a common cultural background could sit down to a good meal, while access to meats like beef—a luxury in Europe— symbolized their economic success. Pastrami, a deli classic, is the result of a mashup between German-Jewish deli culture and Romanian methods for curing meat. Pastirma, an early version of the dish, made its way to Romania by way of the Ottoman Turks who salt-cured dried spice-rubbed meat as a way to preserve it. Goose was the traditional choice in Romania, but thanks to the wide availability of cheap cuts of beef in the United States immigrants were able to develop a weaker salt brine to make the smoky yet tender style of pastrami we know today. It’s thought that the name was changed to rhyme with “salami,” which was already sold in delicatessens and familiar to many Americans by the early 20th century. The exact blend of spices can vary significantly, but cracked coriander, mustard seeds, black peppercorns, brown sugar, and chili flakes are common. Everything bagel seasoning has been a popular flavor for bagels since around 1980, though bagels themselves date back centuries. Many cultures, including Italy, Greece, and Finland, had their own ring-shaped boiled breads. Today’s bagel is most likely a descendant of Polish obwarzanek, which were popular in the royal courts and eventually became a specialty among the Jewish population in Poland. Like pastrami, bagels migrated to New York City with immigrant Polish Jews in the late 19th century, who quickly developed a thriving bagel business. By 1915, the NYC bagel was standardized, and a federation of trade union members strictly controlled its production. While today’s mostly machine-produced bagel is considerably larger than the handmade bagels being produced in New York City over a century ago, the recipe has remained mostly the same: high-gluten flour, water, yeast and malt and (sometimes) salt are mixed, formed into rings, proofed, boiled, then baked. The result is a dense, ringed caramel colored bread with a shiny, crunchy exterior and chewy center. As bagels rose to popularity in the second half of the 20th century, bakeries began offering dozens of different flavors and a wide variety of toppings. The history of everything bagel spice blend itself is hotly contested, with several New York City-based bagel producers claiming to have invented it around the same time. As bagels became popular around the country throughout the late 1980s and early 1990s, everything bagels spread. In the late aughts, everything bagel seasoning began to be sold independently of bagels, becoming wildly popular in its own right thanks to an addictively savory, versatile blend of dried onion, sesame seeds, poppy seeds, garlic, and caraway seeds. Though both pastrami and bagels are now available coast to coast, New York City is still home to some of the country’s most iconic purveyors of pastrami and bagels. 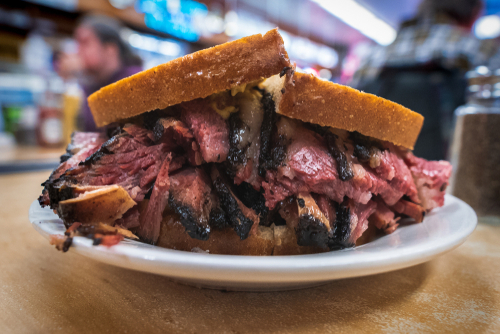 Katz’ Delicatessen, established in 1888, still serves what many believe to be the world’s best pastrami on rye, while shops like Ess-a Bagel carry the characteristic NYC bagel tradition into the 21st century. Hungry for more? You can make delicious NYC-inspired foods at home with Manitou Trading Company’s line of Global Spice Blends and seasonings, including our Pastrami Spice Rub and Everything Bagel Seasoning Blend. Food Fights: Who Invented the Noodle?